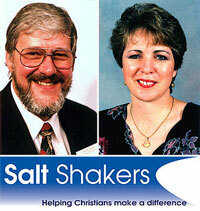 Peter and Jenny started the ministry of SALT SHAKERS in Australia in 1994 after fighting against a gambling venue being established in their local shopping centre. Their aim is to help Christians make a difference by informing them of issues affecting the church and community and motivating them to take action. They have also recently started Resistance Thinking with the aim of helping Christian young adults understand their faith, resist the pervading culture of the day, debate issues and impact society.